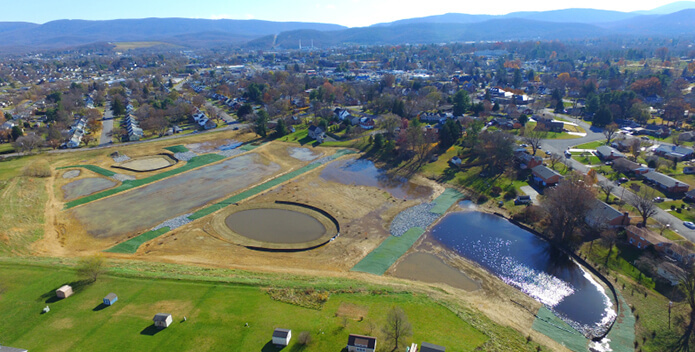 Aerial photo of Waynesboro, Virginia's manmade wetland. The polluted-runoff reduction project was made possible with funds from the Stormwater Local Assistance Fund and Virginia Clean Water Revolving Loan Fund. Recently, part of Waynesboro's Jefferson Park neighborhood has undergone a pretty amazing transformation. What at first glance used to be a boggy, grassy field has been turned into a 10-acre manmade wetland, complete with growing native plants and cascading ponds on a 13-acre site. It was an ambitious project for this small city in the Shenandoah Valley just west of the Blue Ridge. But as the effort nears completion it is starting to pay off. For nearly 20 years the site was an open field with a small stream running through the middle that served as a dry detention pond, meaning that during heavy rains the low-lying field collected and held back excess water. This has helped with flooding issues in the surrounding neighborhood. But as Waynesboro began to look into ways to cut pollution entering the South River, the large field's potential was seen as "low hanging fruit," said Trafford McRae, Waynesboro's Stormwater Program Manager. With changes, the site could have a big impact in reducing polluted runoff. Over the course of 2016, the small stream was routed through terraced pools and ponds carved out of the field. With construction now complete, as each pool fills with water, the excess water cascades over rocks and enters the next pool. Native grasses and trees like bald cypress and silky dogwood surround the new waterways. During a heavy rainstorm, the pools retain and slow down excess water so sediment can settle out, and the plants absorb and filter the polluted runoff before it moves downstream. It will take a year or two for the plants to establish themselves and fill in, but as they do, the site will attract more and more wildlife and beautify the neighborhood. As the plants spread, the wetlands will provide better habitat for frogs, turtles, songbirds, deer, and a host of other animals. McRae envisions that the site will be used as a passive park with a community garden, trails around the pond, and signs explaining the project and history of the nearby stream. The once vacant field will become a community amenity. 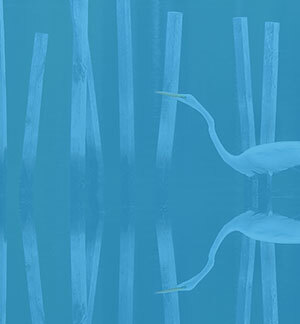 The new wetlands were paid for completely by state grants and loans, including the Stormwater Local Assistance Fund (SLAF) and the Virginia Clean Water Revolving Loan Fund. "We wouldn't have even dreamed of tackling this project for probably another 10 years without the SLAF grant," McRae said. Waynesboro officials are pleased, as they really value local waterways. "More and more, the city council and our community recognize that the South River and its tributary streams here in Waynesboro are among our most valuable resources. We're home to an urban trout fishery; we're installing boat launches and trails along the river; and the South River is a designated blueway," Waynesboro Mayor Bruce Allen said. "Completing the Jefferson Pond retrofit is part of a mindset and a local culture we're promoting here for protecting water resources." ABOVE PHOTOS COURTESY OF TIMMONS GROUP.